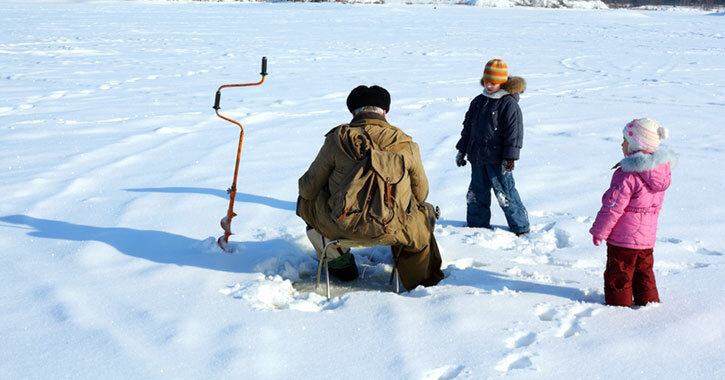 For some of us, the best way to unwind in winter and cure your cabin fever is with an ice fishing trip. 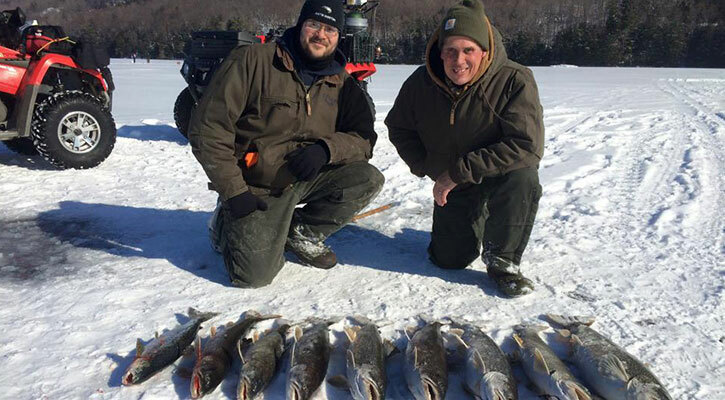 It’s a fun activity that you can do solo or as part of a small group, and in the Lake George Region, you can ice fish without having to travel deep into the Adirondack Park. From the shores of Lake George and Lake Champlain to Cossayuna Lake in the heart of beautiful Washington County, there’s no shortage of ice fishing hotspots. As soon as the ice is safe for walking and fishing, plan a memorable outdoor adventure this winter. 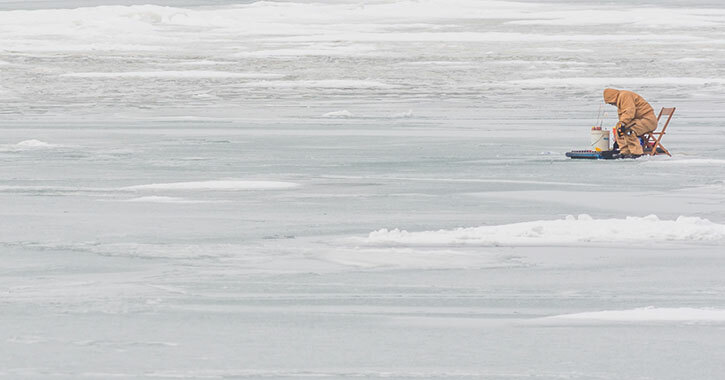 When the surface of Lake George freezes in winter, it transforms into an ice fisherman’s paradise. One of the most popular areas is the southern basin, which typically ices over earlier in the season. What makes ice fishing on Lake George special is that you can catch landlocked salmon through the ice, an uncommon species in the region. They swim right under the ice, but don’t expect to catch them without a challenge! 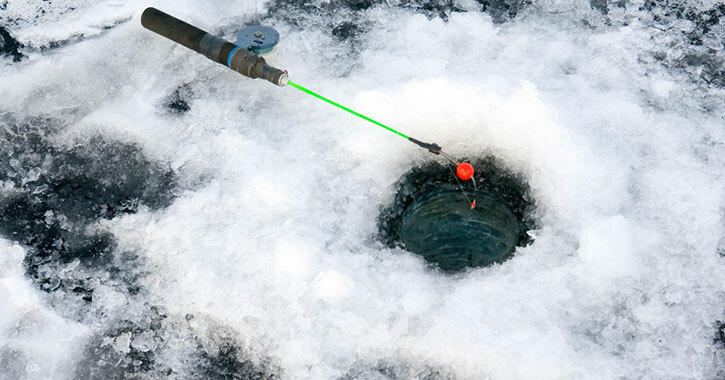 Ice fishermen should react quickly before the salmon have a chance to spit out the bait.  Over the years, Lake Champlain has been called the “Sixth Great Lake” in New York State because of its size. The lake extends 120 miles from Whitehall to the Canadian border and is a major year-round fishing destination. Lake Champlain’s South Bay in Whitehall is a recommended starting point for ice fishermen because the water usually freezes over earlier in winter. You must have a NY State fishing license to fish on this part of the lake. The South Bay of Lake Champlain isn’t the only ice fishing hotspot in Whitehall. The New York State Department of Environmental Conservation (DEC) operates the East Bay Wildlife Management Area (WMA) on County Road 10 and keeps it open year round for non-motorized recreational activities. At 38 acres in size, the East Bay WMA is one of the region’s smallest public places for ice fishing. However, ice fishermen may catch crappie, walleye, pike, and panfish in winter, which makes it a great option for all skill levels. The access point for the WMA is a DEC parking area located off County Road 10. Since the connecting road is unpaved, you’ll want a vehicle that can handle snowy winter conditions. Although the purpose of this state-owned property is for wildlife and habitat management, it is open to the public year round for non-motorized recreational activities. During winter, you’ll typically find snowshoers exploring the area and ice fishermen on frozen Carters Pond. The shoreline is .6-mile long, and ice fishermen may catch bluegill, pumpkinseed, northern pike, and black crappie. When you follow Route 22 south into Washington County, you’ll eventually arrive at one of the region’s hidden gems – Lake Lauderdale in the Town of Jackson. Ice fishermen will be happy to hear the 77-acre lake offers a great variety of fish species to catch, including tiger muskie, bluegill, pumpkinseed, black crappie, and yellow perch. Are you ready to begin your ice fishing adventure in the Lake George Region? Make sure you’re dressed for the winter weather, have all your fishing gear, and own a tool that you can use to check the ice thickness. To help you determine whether or not the ice is safe, we’ve highlighted some top ice safety tips. 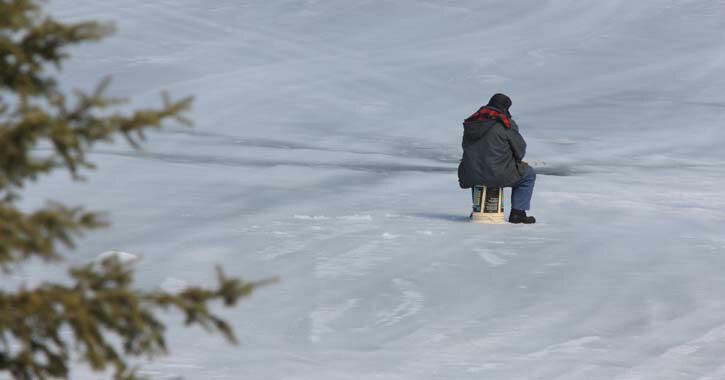 Be smart, stay safe, and have fun ice fishing!